New approaches to the studying of Russian-Swedish frontier organization of 17th c.
Russian-Sweden border along the Sestra (swed. Sister) river fixed in the beginning of 18th c. and from that time kept in one or another case without changing till the Winter war 1939-1940 had been created under the influence of prolonged and complicated correlation between Sweden and Novgorod and later between Sweden and Moscow State. The most significant stages of this correlation were the Orekhov peace of 1323, the Tyavzino Peace of 1595, the Stolbovsky Peace of 1617 and the Nyschtadt Peace of 1721. Meanwhile during the development of all the agreements mentioned above (we suppose all of them were the reflection of the struggle of two states for the control on some Finnish tribes) the system of borderline organization was also developed. In the times of independent Novgorod such organizing of borderline system came to the fortress building, for mostly � the building of stone fortresses (Korela, Kopor'e, Oreshek, Jam). The most active stage of such building was in late 13 � early 14 cc. During that period nor Swedes neither Novgorodians could not capture and hold any stone fortress: both Sweden Vyborg and Novgorodian Korela (Kexholm) had kept in hands of its builders. Nobody knows how the history of Neva banks could follow if the Swedes in the beginning of 14 c. had succeeded in building stone fortress Landskrona. The Orekhov peace of 1323 has a special place among the number of Russian-Sweden pacts. Just that peace had stabilized the Novgorod-Swedish correlation for two hundred years. What is more, the first totally fixed borderline between two states belongs to the time of that peace. The location of the Sweden-Russian boundary after this Peace was currently studied by J. Gallén and J.Lind [Gallén 1968; Gallén & Lind 1991; Lind 1997]. That stable borderline was broken only in the 16th c. while Ivan the Terrible expansion against Sweden in the middle of the century. After the war of 1557 the flimsy peace between two states was achieved while both of them were on the stage of plotting (or reconstruction). The Russian-Sweden frontier line lived a kind of very turbulent life. But instead of it just in that time new churches had been built just nearby the line (fig.1, the St.Mikhail church on Saya river built in 1570s ? [Kniga zapisey 1576/77: 126]). The Livonian war of 1558-1583, during which the Moscow State had suffered a shattering defeat, revealed new approaches to the frontier line organizing. The Sweden general Pontus De la Gardi while successfully moving forward throw western Novgorod districts met not only with medieval Novgorod stone fortresses but also with �ostrozheks� ? temporary wooden-earth fortifications been built already in 16 c. on the most significant arterial roads. In the 1580s the most significant road on the North-West of Novgorod district was the Ivangorod road that had connected Novgorod with Ivangorod ? a fortress in the Narova mouth (Russian Narva in Sweden sources). Just on that road before the war had come into the deepest parts of Novgorod land a number of fortifications near �pogost� (parish) centers (Tesovo, Zarech'e) or other points (Onstopel') were built [Selin 1997]. The events followed in the Russian North-West in late 16th ? early 17th cc. caused great changes in countryside settlement structure. The movement of the population brought about the Ivan's the Terrible �oprichnina� and the events of Livonian war lead to a reduction of the small village number and to the concentration of the most of the peasant population in more or less large village and pogosts (parish centers) [Vorob'ev & Degtyarev 1986: 57]. The exception in this period is the time of Boris Godunov ruling (including the period when Fedor Ivanovitch was Moscow czar). That years (the 1590s and the very beginning of the 17th c.) were a small period of growing stability in Russian countryside. But in trouble time just pogosts, parish centers became also centers of settling, of re-colonization. The choosing of these centers for the colonization was determined by different combine reasons. Just in the late 16th c. small fortresses (gorodoks) appeared near some pogosts of Novgorod Land. We know the mentions of gorodoks near Ofremovsky pogost in Shelonskaya pyatina, near Tigodsky pogost in Vodaskaya pyatina [Kniga zapisey 1576/77: 91 ob., 115 ob.]. Just in 1555 the middle 16th c. the gorodok near Spas on Neva had also appeared [Gramota 1555]. In 1571 the gorodok in Kokola perevara (small local unit) in Kir'yazhsky pogost was mentioned, a year before the oprichniki?had placed in it [Obysk 1571}. Therefore the pogost centers were only the main points of defense; there were also small frontier outposts along the frontier line. Two of them - in Korboselsky and Voskresensky Gorodensky pogost, on the frontier with Vyborg Lähn - were mentioned in 1607 [Gramota 1607; Otpiska 1607]. Meanwhile just in the part of Novgorod Land occupied by Sweden we also mention such ostrozheks that were appeared at that time one after another practically everywhere. We know ostrozhek Bronnitsa near Novgorod that defended the city from the side of the Great Moscow Road [Sundberg 1982: 11], also ostrozheks in Belaya and Bolon'ja on Msta river. In 1614 Moscow general Bogdan Chulkov was offered to held warriors and to go on the state service in Volkhov mouth that near the Ladoga Lake and to built an ostrozhek there and to organize raids against Swedes and Lithuanians from it. [Otpiska 1614à]. But Chulkov changed his way and went to Zaonezh'e, to Pudoga pogost where he hold some Cossacks from the two ostrozheks (Pudoga and Shala, near the adequate pogosts) and moved to Andoma ostrozhek (also near the pogost of the same name) where the Lithuanians had been [Otpiska 1614à]. In a short time Chulkov built ostrozheks in the Tolvuj and in Shuja pogost [Otpiska 1614b]. In 1614 practically each pogost in Zaonezh'e had a kind of fortification. In the same time we know Veino ostrozhek on the Great Moscow Road and Ramyshevo ostrozhek on Lovat' [Otpiska 1614c; Kniga seunchej 1613-1619: 15]. In 1615 the Dutch ambassador van Brederode while tripping along the North Western part of Novgorod Land noticed �shantzes� in Zarech'e, Tesovo and Staritza (on Luga) [Brederode 1991: 215]. The war proceedings of Muscovites at that time was held with taking into account the basing in such ostrozheks. In the same year another ostrozhek on Luga was mentioned, near the village of Ivnya in St.Demetriy Gorodensky pogost [Chelobitnaya 1615] (fig. 2). The most far away from Novgorod ostrozhek was the one in Cherensky pogost of Bezhetskaya pyatina. It was situated on Kabozha River near its mouth. The ostrozhek is known from 1611, when there was Sweden rotmiester Fransbruck's detachment [Otpiska 1611]. In 1612 the ostrozhek was still a danger for Muscovites [Otpiska 1612]. Generally the Eastern border of Novgorod land was well reinforced by Swedes as the most possible point of Muscovites' invasion. In 1613 the Muscovite commander of Ustjuzhna-Zheleznopolskaya wrote to his superiors in Beloozero: �The Nemetskie warriors left the ostrozheks� [Otpiska 1613]. Each ostrozhek was the center for a temporal administrative unit of a number of pogosts which population was to furnish the Sweden garrisons (so the Tesovo ostrozhek was a center for 3 pogosts, the Cherensky - for 12). Such a system of ostrozheks - the basic points made by Sweden in the epoch of total devastation that had become in Novgorod land after Sweden army departure was convenient enough for Muscovite war administration. However only a small number of ostrozheks existed in 1611-1617 were mentioned in the documents of the later time. Swedes also continued to use the ostrozheks in Ingermanland during the 17th c. In 1623 Muscovites sent a deserter to the Zarech'e ostrozhek near Zarech'e pogost [Pamyat' 1623]. On June 2, 1656 the Novgorodian streltsy (a sort of army) were sent to Solomenny ostrozhek (near Solomyansky pogost in Karelia - Sweden at that time) [Gulevitch 1911: 36]. A �fortress hill� - linnavuori of 16th-17th cc. is archaeologically known near Ilomanten - former Ilomansky pogost of Karelia [Taavitsainen 1997]. One Russian ostrozhek was situated near St.Kliment pogost in Tesovo of Vodskaya pyatina on the bank of Tesovskoye Lake connected by small brook with Oredezh river, on the cross of the land road from Novgorod to Ivangorod [Selin 1996] with the river way that also connected Novgorod with the Baltic Sea. Firstly Tesovo was mentioned in the First Novgorod Chronicle in 13th c. (in 1233 and 1240 [NPL 1950: 72, 282,295]), then it became a center of archbishop's land property, then, between 1478 and 1500 it was confiscated by Moscow prince Ivan III. In 16th c. the newly built Ivangorod road passed near Tesovo, a road station was organized there and the carriers were settled near the neighbor Spassky pogost. Tesovo outpost was the most important point of the Novgorod Land defense from North-West. The first point on the Russian side near the borderline was Osinovaya Gorka on Ivangorod road where the exchanging of deserters had ever been [Zherbin 1956: 49; Otpiska 1636]. According to the native folklore tradition there were also some frontier fortifications [Plan lesonasazhdeniy 1874]. Further on the way to Novgorod there was the St.Trinity Zverinsky monastery where was also an outpost in the 17th c. In 1631 there were streltsy of I.Boranov's detachment (may be it was the same I.Boranov who was the head of Ivnya ostrozhek in 1615) [Otpiska 1631]. The monastic dwellings were sometimes used as a prison for deserters. And the Tesovo outpost was only the third fortified point on the Ivangorod road. The example of Tesovo is not an accidental one. The consideration of urbanization process in Tesovo surroundings could help us to choose a direction of its studying in Novgorod Land as a whole. As we had already mentioned, Tesovo had disappeared from the sources after 1240s. During the 15th c. a large land property of Novgorod archbishop was formed around Tesovo. In early 16th c. the St.Kliment pogost appeared there. We do not know exactly the history of this settlement in the middle 16th c. In the end of the century it appeared as a large settlement with not agricultural functions: there were built the State pier, where goods from Baltic sea had been ever unloaded; from that place it had been carried to Novgorod by land road. Tesovo received a new impulse to development in the years of Sweden occupation in early 17th c.: the fortifications built at that time were in use till the beginning of the Northern War 1700-1721. Probably it is better to examine the Tesovo fate in the whole context of Novgorod urbanization. We can contemplate that before the end of 15th c. the pogost centers did not develop into towns because of Novgorod that stopped any attempt to independence. The town, not agricultural functions of those centers have appeared in 16th c. and in the Time of Troubles manifested particularly brightly. After the Stolbovsky Peace 1618 the ostrozheks built during the war mainly disappeared. Tesovo in this case is an exception connected with the building of the new Russian-Sweden frontier in the 17th c. and not with the pogost system. The process of the creation of small fortifications along the Russian-Sweden frontier was accompanied with the appearing of a number of war settlements near it. There we ought to speak much more on the problem of the deserters on the Russian-Sweden frontier. The main reason for the migration of the population from the regions that had been change hands to Sweden after 1617 was the violent measures of the king Gustaff Adolph directed to the Orthodox population. Namely the religious factor was the determinant for the crossing the borderline. There one could find some specific traces in the connections between the Moscow State and its subject: the baptism, more exactly - the adoption Orthodox custom was itself an act of the adoption of Russian (Muscovite) citizenship. In such a case the population moved by any possibility had been from Sweden to Muscovite State automatically became Russian subjects. In the 2nd half of 17th c. in the frontier regions of Novgorod Land a new administrative unit was formed under the name of Tesovskaya Dvortsovaya (State) volost'. Its first recording belongs to 1674-1676 [Spisok 1674/76]. The analysis of this description showed hat the villages of St.Kliment, Spassky and Budkovsky pogosts that had become deserted in the Time of Troubles were settled with the deserters - immigrants mostly from the Kopor'e district. These resettled villages formed the Tesovskaya Dvortsovaya (State) volost'. In 1733 it was changed to the St. Alexander Nevsky monastery in St.Petersburg [Imennoy ukaz 1733] and in 1775 passed to St.Petersburg Province whereas all the other settlement of the mentioned pogosts left in Novgorod Province. Probably the migrants of the 17th c. were mainly Izhoras that had determinate the ethnic structure of this territory. Namely in the Tesovskaya State volost' and in the neighbor land property of the St.Trinity Zverinsky monastery the researches of the Izhora language and culture distinguished a local Upper-Oredezh dialect of the Izhora language. According to P.I.Keppen in the middle 19th c. in Luzhsky district Izhoras lived in the villages: Nesterkovo, Tarasino, Kremena, Votsko (or Novoselki), Ol'khovets, Ozereshno, Novinka, Chascha, Nizovka (in 1840 resettled from Chascha), Lugi, Chernitsa (in 1842 resettled from Lugi), Pelkova [Keppen 1853]. Just those settlements in the 17th c. were included into Tesovskaya volost' or belonged to St.Trinity Zverinsky monastery. The modern researches confine the Upper-Oredezh dialect also in the number of this villages [Kon'kova 1992; Fedorov 1983] (fig. 4). The forming of Tesovskaya volost' in the nearest of Sweden-Russian borderline was followed with the other circumstance. According to the conditions of the Stolbovsky peace 1617 the territories of Jam, Korela, Oreshek, Ivangorod and Kopor'e districts were transferred to Sweden. The Kopor'e district in the 16th c. included, on the top of all, Gresensky and Orlinsky pogosts. The Tesovskaya volost' appeared in 1670s on the space of borderline vast places included the villages Sorochkino Boloto, Lugi and Chernetsovo. All those settlements in 1500 were in Gresensky and Orlinsky pogosts. Consciously or accidentally but Russian officials who had made the Russian-Sweden borderline left some territory of Kopor'e district for the Moscow State to the detriment of the Stolbovsky Peace conditions [Selin 1995a; Selin 1995b]. . The inhabitants of Tesovskaya volost' - the late Sweden subjects - were to settle lands deserted during the Time of Troubles, in the closest neighborhood with the frontier. Just those villages were in danger in any conflict situation. When the wars begun (in 1655 and in 1700s) Swedes destroyed those villages and also the St.Trinity Zverinsky monastery on the Ivangorod Road. Thus, it was completely destroyed in 1657. Till 1662 the monastery was uninhabited and in 1662-1663 the monk Theodosey, the new head and builder of the monastery, fall 1200 logs and transported them for new dwellings himself [Pamyat' 1663]. Just the same had happened in the beginning of the Northern War 1700-1721 when the enemies after the first Narva campaign, continually disturbed each other with raids that often have been of robber character [Perepisnaya kniga 1709: 67; Zhurnal 1770: 25]. All of this created the specific traces of everyday life in such settlements and the inhabitants of them had become war settlers indeed. One can mention that in the modern folklore tradition of the contemporary countryside inhabitants of those territories that are ethnically Russian the self-denomination as �Swedes� is very often. Of course this is the evidence of more �political� than �ethnical� origin of this population whose forefathers after the Time of Troubles came from the Sweden border and settled the vast lands [my interviews in Scvhupogolovo, Luzhsky district, May 2, 1991; in Kastuja, Tosnensky district, May 2, 1999]. The Moscow State by all ways tried to hide the creation of those settlements near the frontier. It played a double game with Sweden. For the first time in the position of the Peace treatment recently signed, aspiring not to let any political conflict the Moscow State sent the officials to find and to return the deserters indeed. The meetings of Sweden and Moscow representatives for the deserters changing were hold regularly. But also in the same time the secret order to the frontier state commanders and governors was created. It was directed to meet those deserters but to hide them and to settle far from the frontier [Czarsakaya gramota 1625]. After the War 1656-1657 the situation changed. Since that to State made regular settlements along the frontier. In that position all the territory along the frontier was forbidden to be sold or to be distribute to gentlemen [Spornoe delo 1700]. One of the most important factors in the relations between Russian and Sweden authorities was as we had already mentioned the religious one. And in the cultural situation of the 17th c. it had actualized in a particular way. In the time of Novgorod-Sweden State of 1611-1617 these relations were soft (there were even some parleys about a possible contact between the two Churches [Kovalenko 1995]), but after the Stolbovsky peace 1617 the interrelations between the churches had became deteriorating. The Sweden Government tried to control the Orthodox clergy in the districts annexed and the Moscow state in the same time attempted to leave it under the control of Novgorod archbishop [Czarsakaya gramota 1619; Gramota Makarya 1619]. Incidentally the departure of priests to the �Moscow side� also furtively encouraged by Moscow State [Czarsakaya gramota 1624]. The changes in the system of frontier organization proceeded in the result of Russian-Sweden war 1656-1657. The first deal of Moscow State after the beginning of the war was the order sent to all the outposts that permitted to meet the deserters � kindly� [Gadzyatsky 1945: 22]. The main centers of the army concentration were the well-fortified points ? Ladoga and Tesovo. There the detachments of Novgorod landowners and gentlemen stayed under the leadership of the commanders - prince Bogdan Eletsky (in Tesovo) and Boris Tushin (in Ladoga) [Gadzyatsky 1945: 27-28]. The Sweden troops had also concentrated around the osrozheks near pogosts - in Zarech'e and Izhersky pogost. The Lavujskiy outpost was an important point of defense during that war. Now it is the only one monument of such type archaeologically studied. The Lavujskiy ostrozhek is known throw a number of documents of the 17th c. According to V.P.Petrenko it had appeared on the place of the medieval Novgorodian fortress of 12-13th cc. [Peterenko 1982]. Then from 1500 and till the late 16th c. - till the building of the ostrozhek - there was a village Gorodische [VOIDR 1851: 61]. Before the confiscation by Ivan III it belonged to one of the greatest landowners of Ladoga district - Fedor Pobeditsky. The studying of the outpost by V.P.Petrenko revealed the traces of the fortress of the 17th c. Initially one can mention that whole the system of frontier outposts along the Russian-Sweden frontier of 1617-1700 was connected with the main roads. All of them were on the roads: the Lavujskiy outpost on the road from Ladoga to Oreshek, the Tesovo outpost on the Ivangorod road, the Kostovskiy outpost on the Oreshek road. The outpost in the center of the Rozhdestvensky pogost on Pasha River probably controlled the road from Olonets to Ladoga [Czarsakaya gramota 1657] (fig. 3). On the eve of the war at the same time with the building of the Olonets fortress there was created an outpost on the Russian-Sweden frontier in Samro volost' [Nakaz 1649]. Initially the watch over the outpost was the duty of the �arable soldiers� - the former peasants of the Samro volost' (remember the similar principle of troop organizing in Sweden). Such a practice was sampled by Moscow State being in need in money in Zaonezh'e where the transforming the peasants to �arable soldiers� caused the great indignation [Bogoslovsky 1911]. Such a system was on the Russian-Sweden frontier during all the rule of the czars Aleksey Mikhailovich and Fedor Alekseevich. At that time the main root for frontier defense were the settlers along the frontier - or the deserters, such as war settlers in Tesovo volost', either the settled �arable soldiers�, former peasants in Zaonezh'e and Samro volost'. A kind of �cheap frontier� was created. Serious changes came only just before the Northern War of 1700-1721. There is one document fixing the system of small ostrozheks and outposts in 1698 [Obysknye knigi 1698]. It could be the basic document for the making a conception of the number of frontier defenders and of the concrete defense system. Fig. 5. 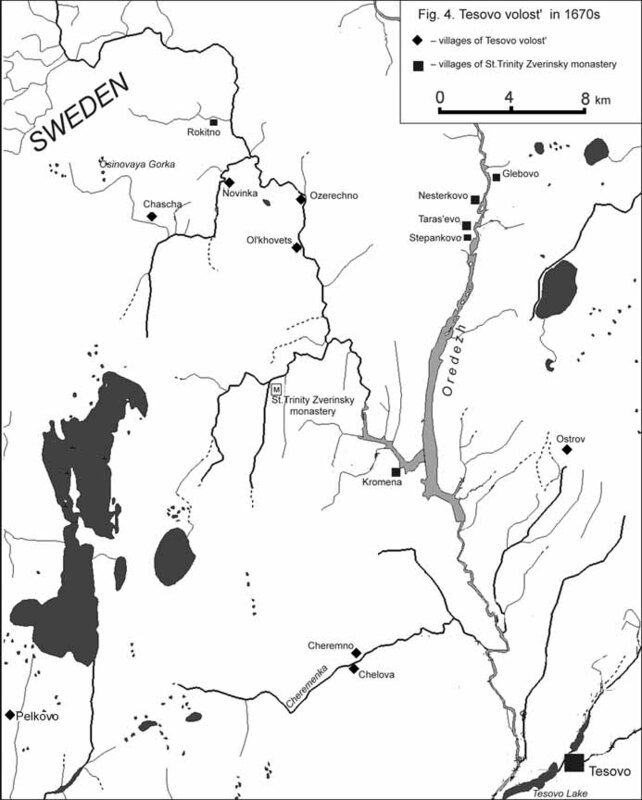 Outposts, outpost commanders and garrisons on the Russian-Sweden frontier in 1698. Many points of this system had existed just in the middle 17th c. For example the outpost in Onezhitsy is known from the time of Russian-Sweden war of 1656-1657 [Pamyat' 1659]. In 1658 the Cossacks from Ladoga (as streltsy in 1698) stayed changing after half a year on the Lavujskiy outpost [Chelobitnaya 1658/59]. It is significant that in 1698 the commander of The Tesovo ostrozhek was stol'nik Fedor Ushakov - a person of high range in Moscow administration. This shows the attention of the Moscow State to the ostrozhek. But in 1698 in the defense organization we could not see any trace of former war settlements. Possibly their fonctions were at that time transferred to the troops of streltsy and soldiers. The soldiers were possibly from the Ivan Ridder's regiment placed in Novgorod [Bobrovsky 1891: 17-18]. On the opposite side of the frontier before the Northern War the Sweden cavalry stayed in Lopsky pogost and in Porech'e myza [Voenno-pochodny zhurnal 1701/05: 67]. During Peter's the Great reforming the frontier system had been significantly changed, although the attention to fortresses was still actual in the 18th c. But after the Nischtadt Peace of 1721 the frontier moved back from the old Novgorod lands. This is out of our consideration. In the conclusion I like to outline the possible sources that could help to take some new data on the Russian-Sweden frontier of 16th-17th cc. The most significant place belongs to the archaeoloical sources. In 1998-1999 we began to excavate a settlement near former St.Kliment pogost in Tesovo, may be also near Tesovo ostrozhek of 17th c. The data received does not let us to make some conclusion on the frontier organisation. Possibly the further excavation would tell us some more on this subject. In 1999 we also found the place of former Zarech'e pogost and ostrozhek which in 17th c. played the same role from the Sweden side of the frontier. The data of the contemporary folklore tradition plays a special role for the fixing (and sometimes - even for the revealing) of some archaeological monuments. The historical traditions about intervenes correspond with some reality of the 17th c. very often. The brightest example of it is the fixing on one map of 19th c. that introduce one wooden territory some places named accordingly �the Novgorod guard-place� and �the King's guard-place�. That wooden territory was just near the cross of the Russian-Sweden frontier by the Ivangorod road. There is no doubt that both the places correspond with some small guard-places existed in the 17th c. We also mentioned the traditions with the indications of Sweden frontier in many places along the former borderline [my interview in the village Bolshie Sabitsy, Gatchinsky district, April, 24, 1990; in the village Konechki, Tosnensky district, April, 25, 1990]. Possibly the more purposed and deep collection and study of such data could enlighten the picture of Russian-Sweden border of 17th c. Belokurov 1907 - Belocurov S.A. Razryadnye zapisi za Smutnoye vremya (The War-Official proceedings for the Time of Troubles) Chteniya v obschestve istorii i drevostey Rossijskikh. 1907, Nr 3. Bobrovsky 1891 - Bobrovsky P.O. Zavoevanie Ingrii Petrom Velikim (1701-1703) (The Conquering of Ingria by Peter the Great (1701-1703)). SPb., 1891. Bogoslovsky 1911 - Bogoslovsky M.M. Zemskoye samoupravlenie na Russkom Severe (The Land Self-government on Russian North. Vol. 2. M., 1911. Brederode 1991 - Posolstvo van Brederode, Bassa i Ioakimi v Rossiju i ikh donesenia Generalnym Shtatam (The Embassy of von Brederode, Bass and Ioakimi to Russia and their report to the General States) Proezhaya po Moscovii. M., 1991. Chelobitnaya 1615 - Chelobitnaya Oriny, zheny Voina Novokschenova na svoikh krestyan (The Petition of Orina, Voin Novokschenov's wife on her peasants) Jakubov K.I. Russkie rukopisi Stokgolmskogo archiva. 1890. P. 28. Chelobitnaya 1658/59 - Chelobitnaya ladozhskikh konnykh kasakov o vydache iz Novgoroda im proezhei gramoty v Oreshek dlya syska loshadey (The Petition of Ladoga mounted Cossacks for a pass from Novgorod to Oreshek for the search for the lost horses). 1658/59 St.Petersburg Brunch of the Institute of Russian History, f. 109, d. 127. Czarsakaya gramota 1619 - Czarsakaya gramota novgorodskomu mitropolitu Makariju o pastyrskom nastavlenii pravoslavnomu dukhovenstvu ostavshemusya v ustuplennykh Svetsii zemlyakh (The Czar's Ordnance to the Novgorod archbishop Makarey for the pastor advice for the Orthodox clergy lost in the lands conceded to Sweden). 1619. 17.08 Acty, sobrannye Archeograficheskoj ekspeditsiej. Vol. 3. SPb., 1836. Nr. 107. P. 146-147. Czarsakaya gramota 1624 - Czarsakaya gramota novgorodskomu voevode knyazu Romodanovskomu o lyudyakh dukhovnogo zvaniya, vyshedshikh is ustuplennykh Shvetsii zemel (The Czar's Ordnance to the Novgorod governor Prince Romodanovsky about the clegy came from the lands conceded to Sweden) 1624, August, 15. Acty, sobrannye Archeograficheskoj ekspeditsiej. Vol. 3. SPb., 1836. Nr. 155. P. 222. Czarsakaya gramota 1625 - Czarsakaya gramota novgorodskomu voevode knyazu Romodanovskomu o vzaimnom so Shvedami razmenivanii perebezhchikov (The Czar's Ordnance to the Novgorod governor Prince Romodanovsky about the co-exchanging of the deserters with Swedes) 1625, September, 10. Acty, sobrannye Archeograficheskoj ekspeditsiej. Vol. 3. SPb., 1836. Nr. 165. P. 233-240. Czarsakaya gramota 1657 - Czarsakaya gramota v Velikij Novgorod o proizvedenii rozyska o pritesneniyakh prislannym s Olontsa v Novgorodskiy uezd korelyanam novgorodskimi dvoryanami i det'mi boyarskimi i ob okhranenii ikh ot nasiliya (The Czar's Ordnance to Novgorod the Great about the judicial investigation on the persecutions on the Korelians sent to Novgorod distrikt from Olonets by the Novgorod gentlemen and about the guarding the Korelians from any violence). 1657, March, 12. Acty, sobrannye Archeograficheskoj ekspeditsiej. Vol. 4. SPb., 1836. Nr. 94. P. 133-134. Fedorov 1983 � Fedorov I.T. 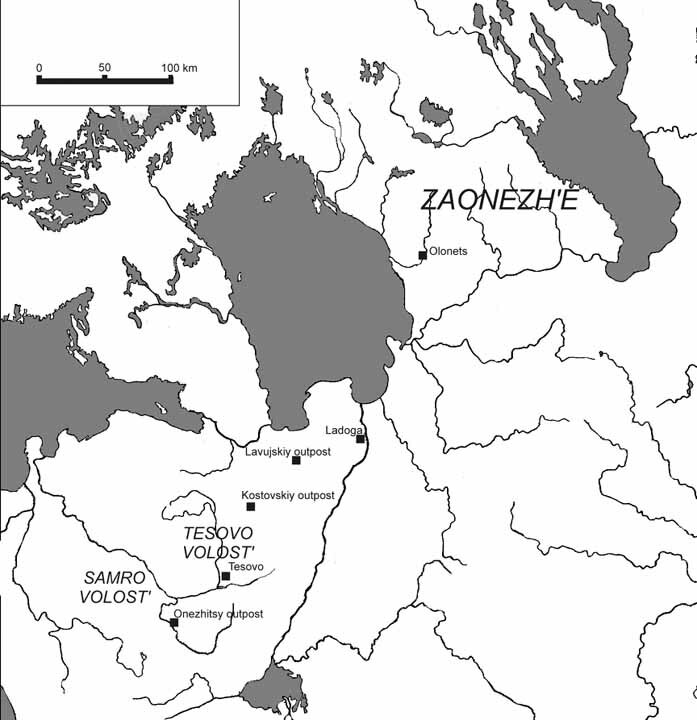 Rasselenie izhory v 19-20 vekakh (The settling of Izhora in 19-20th cc.) Sovetskaya Ethnografia. 1983. Nr. 5. P. 97-104. Gadzyatsky 1945 � Gadzyatsky S. Bor'ba russkikh ljudey Izhorskoj zemli v 17 veke protiv inozemnogo vlafychestva (The Struggle of Russians of Izhora Land in 17th c. agains the Foreign Dominion) Istorycheskie zapiski. 1945. Vol. 16. Gallén 1968 � Gallén J. Nöteborgsfreden och Finlands Medeltida Östgräns (Skrifter Utgivna av Svenska Litteratursällskapet i Finland. Nr. 427:1). Helsingfors, 1968. Gallén & Lind 1991 � Gallén J., Lind J. Nöteborgsfreden och Finlands Medeltida Östgräns. Andra delen (Skrifter Utgivna av Svenska Litteratursällskapet i Finland. Nr. 427:2). Helsingfors, 1991. Gramota 1555 - Gramota czarya i velikogo knyaza Ivana Vasil'evicha Vseya Rusi v Velikij Novgorod djakam F.Yeremeevu i K.Dubrovskomu o posylke prikazchikov v Kipensky pogost i k Spasu na Nevu dlya prigotovlenija kormu voisku czarevicha Kaibuly (The Ordonance by Czar and Great Prince of All Russia Ivan Vasil'evich to Novgorod the Great to diaks F.Yeremeev and K.Dubrovsky on the sending the officials to Kipensky pogost and to Spas on Neva for the supplying the army of czarevich Kajbala with food). 1555, December, 4. Dopolnenija k Aktam istoricheskim. Vol. 1. SPb., 1846. Nr. 70, V. P. 130-131. Gramota 1607 - Gramota shvedskogo korolya o razreshenii ego voinskim lyudyam projti v RugodivRusskoj zemlej beregom (The Ordonance of the Sweden King for the permission for his troops to go to Rugodiv throw Russian Land). 1607, Februrary, 3. Smutnoje vremya Moskovskogo Gosudarstva. Instalment 2. Akty vremen pravlenija czarya Vasilya Shuiskogo (1606. 19 May? 17 July 1610 ) / Ed. A.M.Gnevushev. P. 85. Gramota Makarya 1619 - Gramota novgorodskogo mitropolita Makarya v Korelu k tamoshnemu dukhovenstvu o tom, chtoby ono khranilo pravoslavie, a v dukhovnykh nuzhdakh otnosilos' k nemu v Novgorod (The Ordonance of Novgorod archbishop Makarey to Korela clergy about preserving the Orthodoxy and the adressing to him for any spiritual need) 1619, August. Acty, sobrannye Archeograficheskoj ekspeditsiej. Vol. 4. SPb., 1836. Nr. 108. P. 147-149. Gulevitch 1911 � Gulevitch S. Istoriya vos'mogo pekhotnogo Estlyandskogo polka. 1478-1911 (The history of the 8th Estland Regiment. 1478-1911). SPb., 1911..
Imennoy ukaz 1733 - Imennoy ukaz , dannyj Senatu ob otdache Aleksandro-Nevskomu monastyrju v vechnoye vladenie votchin Starorusskogo Iverskogo monastyrya, nekotorykh dvortsovykh volostey i otpisnykh u knyazya Dolgorukogo, vzamen vzyatykh u onogo monastyrya i pripisnykh k dvortsovomu vedomstvu volostey Tolmachevskoj, Dorskoj i Okhonskoj (The Ordonance in the Czar's name to Senat on the Trasnferring of some land posessions of Starorussky Iversky monastery, some posessions of the Dvorets and the posessions confiscated from prince Dolgoruky to St. Aleksandr Nevsky Monastery in exchange for the Tolmachevo, Dorakaya and Okhona volosties confoscated from the monastery). 1733, June, 11. Polnoye sobranije rasporyazheniy i uzakonenij po vedomstvu pravoslavnogo veroispovedanija. Vol. 8. SPb., 1898. P. 351-352. Jakubov 1890 � Jakubov K.I. Russkie rukopisi Stokgol'mskogo archiva (Russian manuscriptes of Stockholm archive) Chteniya v obschestve istorii i drevostey Rossijskikh. 1890. Nr 2. Keppen 1853 � Keppen P.I. Selenija, obitaemyje izhorami v Sankt-Peterburgskoj gubernii (The settlements inhabited by Izhoras in St.Petersburg Province) Uchenyje zapiski Imperatorskoj akademii nauk po 1 i 3 otdeleniyam. Vol. 2. Nr. 3. SPb., 1853. P. 412-422. Kniga seunchej 1613-1619 � Kniga seunchej (The book of regards). 1613-1619. Pamyatniki istorii Vostochnoj Evropy. Istochniki 15 - 17 vekov. Vol. 1. M.; Warszawa, 1995. P. 11-98. Kniga zapisey 1576/77 � Kniga zapisey Sofijskoj poshliny (The Book of the recording of St. Sophia customs duty). 1576/77 The Manuscript Department of Russian National Library. Soph., 1548. Kniga zapisnaya 1615 � Kniga zapisnaya sbora khleba i deneg dlya shvedskikh vojsk po Tesovskomu ostrozhku (The Record Book of Bread and Money Fee from Tesovo ostrozhek for Sweden army). 1615 State Archive of Sweden in Stockholm (mikrophilm 403 in St.Petersburg Brunch of the Institute of Russian History). Kon'kova 1992 � Kon'kova O.I. Izhora My zhivem na odnoj zemle. Naselenije Peterburga i Leningradskoj oblasti. SPb., 1992. P. 89-109. Kovalenko 1995 � Kovalenko G.M. Shvetsia i Rossia v 17 veke: Iz istorii politicheskikh i kul'turnykh svyazej (Sweden and Russia in the 17th c. On the history of Political and Cultural Relations) Rapportserie utg. Av Forskningarkivet vid Umeå Universitet. Scriptum Nr. 40. 1995. Lind 1997 � Lind J. Russko-Shvedskaya granitsa po Orekhovskomu (Nöteborg-Pähkinälinna) miru i politichesky status severa Fennoskandii (Russian-Sweden frontier according to the Oreshek (Nöteborg-Pähkinälinna) Peace and the political status of the Fennoscandia North Srednie veka. Vol. 59. 1997. P. 96-115. Nakaz 1649 - Nakaz voevode Ivanisu Kaisarovu ob upravlenii Starorusskogo uezda Sumerskoj i Staropol'skoj volostej krest'yanami naznachennymi k obrascheniyu v osedlyje soldaty (The Ordonance to the Commander Ivanis Kaisarov on the ruling of peasants appointed to settled soldiers in the Samro and Staropol'e volost' of Staraya Russa district. 1649, November, 21. Dopolnenija k Aktam istoricheskim. Vol. 3. SPb., 1848. Nr. 65.I. P. 231-235. Nevolin 1859 � Nevolin K.A. Obrazovaniye upravlenija v Rossii ot Ivana III do Petra Velikogo (The Creation of Government in Russia from Ivan III till Peter the Great) Nevolin K.A. Polnoe sobranije sochinenij. Vol. 6. SPb., 1859. NPL 1950 � Novgorodskaya pervaya letopis' starshego i mladshego izvoda (The First Novgorod Chronicle of the Old and Junior redaction). Ì.; L., 1950. Obysk 1571 - Obysk 21 marta 1571 goda opustevshokh krest'yanskokh zhereb'ev v perevarakh chernykh krest'yan Kir'yazhskogo pogosta Vodskoy pyatiny (The Searching of the deserted peasant lots in the perevars of State peasants of Kir'yazhsky pogost of Vodskaya pyatina, 1571, March, 21) Samokvasov D.Ya. Archivny material. Novootkrytyje documenty pomestno-votchinnykh uchrezhdeny Moskovskogo czarstva. Ì., 1908. Vol. 2. Part 2. P. 106. Obysknye knigi 1698 - Obysknye knigi (godovyje smentyje rospisi) Novgoroda, Ladogi, Porkhova. (The Searching Book (the Year Estimate List) of Novgorod, Ladoga, Porkhov) 1698 St.Petersburg Brunch of the Institute of Russian History, kol. 115, op. 1, d. 324. Opis' Novgoroda 1617 � Opis' Novgoroda 1617 goda. Pamyatniki otechestvennoj istorii (The Inventory of Novgorod 1617. The Monuments of Domestic History). Instalment 3. Part 1. Ì., 1984. Otpiska 1607 - Otpiska k gosudaryu ot Korelskogo voevody o priezde shvedskogo gontsa i dibytykh u nego svedenij (The List from the Korela governor to the Czar about the Sweden messenger arrival and on the information received from him) 1607. 15.06 Smutnoje vremya Moskovskogo Gosudarstva. Instalment 2. Akty vremen pravlenija czarya Vasilya Shuiskogo (1606, May, 19 ?1610, July,17) / Ed. A.M.Gnevushev. P. 106-107. Otpiska 1611 - Otpiska boyarinu i bolshomu voevode Ya.P.Delagardu i boyarinu knyazu I.N.Bolshomu Odoevskomu T.Zagoskina poslannogo v Cherensky ostrog dlya sbora kormov s Belozerskaya polovina Bezhetskoy pyatiny ratnym lyudyam rotmistra Fransbruka o tom, chto 12 pogostov Belozerskoy poloviny dayut kormy rotmistru Iriku Bersu, chto kormy s pogostov, dozrennykh Kazarinom Unkovskim budut sobirat'sya po rospisi s novogo dozora, chto rotmistr Fransbruk ne otpuskayet ego, Zagoskina i chto podyachej Druzhina Kharitonov, poslannyj dlya dela ne goditsya (The Report to Boyarin and Great Commander J.De la Gardie and to Boyarin Prince I.P.Bolshoy Odoevsky from T.Zagoskin, who was sent to the Cherensky ostrog in the Belozerskaya part of Bezhetskaya pyatina for the food dues for the troops of rotmiester Fransbruck, that the 12 pogosts of the Belozerskaya part supplies with food rotmiester I.Berk, that there is the nessesity in new record of the pogosts after Kazarin Unkovsky's, that rotmiester Fransbruck does not let him go and that the official Druzhina Kharitonov is not suitable for the staff. 1611. St.Petersburg Brunch of the Institute of Russian History, kol. 124, op. 1, karton 4, d. 505. Otpiska 1612 - Otpiska belozerskogo voevody G.Obraztsova voevodam knyazu Trubetskomu s tovarischami pro nemetskikh lyudey i o malom chisle vojska na Beloozere (The Report by Beloozero Governor G.Obraztsov to the Commanders Prince Trubetskoy and his officials about the Swedes and a few number of troops in Beloozero). 1612, December. Acty, sobrannye Archeograficheskoj ekspeditsiej. Vol. 2. SPb., 1836. P. 368. Otpiska 1613 - Otpiska Ustyuzhno-Zheleznopol'skogo voecody knyaza Andreya Sitskogo s tovarischami Belozerskomu voevode G.Obraztsovu o dvizhenii shvedov i litovtsev v Novgorodskom uezde (The Report by Ustyuzhna-Zheleznopol'skaya Governor Prince Andrey Sitsky with officials to the Beloozero Governor G.Obraztsov about the Swedes' and Lithuanians mooving in Novgorod district. 1613, December, 4. Dopolnenija k Aktam istoricheskim. Vol. 1. SPb., 1846. Nr. 179. P. 311. Otpiska 1614à - Otpiska Bogdana Chulkova o porazhenii im s kozakami i okhochimi lyud'mi pod Andomskim ostrozhkom v Zaonezhskikh pogostakh litovskikh ljudey i o pogone za nimi pod Kargopol' s prilozheniem spiska kazakov i okhochikh lyudey, koi byli s nim v Andomskom ostrozhke (The Report by Commander B.Chulkov about his victory over the Lithuanians near Andomsky osrozek in Zaonezh'e and about the pursuit till Kargopol' with the enclosure of a list of Cossacks and Volonteers that were with him). 1614. Akty Moskovskogo Gosudarstva. Vol. 1. 1890. Nr. 47. P. 82-84. Otpiska 1614b - Otpiska voevody B.Chulkova ob otbitii pol'skikh i litovskikh lyudey ot Nikolskogo i Shujskogo ostrozhkov s prilozheniem doprosnykh rechey jazykov o kolichestve nepriyatelskogo vojska (The Report by Commander B.Chulkov about the beating Poles and Lithuatians off the Nikolsky and Shujsky ostrozheks with the enclosure of the interrogate protocoles of the prisoners about the number of enemy troops. 1614. Akty Moskovskogo Gosudarstva. Vol. 1. 1890. Nr. 59. P. 95-96. Otpiska 1614c - Otpiska voevod D.Trubetskogo s tovarischami o privode k nim atamanom Ivanom Mikulinym jazykov nemetskikh lyudey i ob otsylke ikh v Moskvu. Rassprosnye rechi jazykov (The Report by Commander Prince D.Trubetskoy with his officials about the Sweden prisoners brought to them by Cossack ataman Ivan Mikulin and their departure to Moscow. The interrogate protocoles of the prisoners). 1614. Akty Moskovskogo Gosudarstva. Vol. 1. 1890. Nr. 78. P. 115-118. Otpiska 1631 - Otpiska novgorodskikh voevod o prinyatii mer protiv vykhodtsev iz-za rubezha i russkikh perebezhchikov (The Report by Novgorod Governors about the measures hold agains the abroad emigrants and Russian deserters). 1631. Akty Moskovskogo Gosudarstva. Vol. 1. 1890. P. 330-332. Otpiska 1636 - Otpiska A.Melnitskogo i S.Sverbeeva v Novgorod o puti ikh na Osinovuju Gorku dlya perebezhchitskoj razmeny (The Report by A.Melnitsky and S.Sverbeev to Novgorod about thear way to Osinovaya Gorka for deserters exchanging). 1636, March, 29. St.Petersburg Brunch of the Institute of Russian History, f. 109, d. 595. Pamyat' 1623 - Pamyat) gubnomu staroste M.Neelovu o vykhodtse I.Prokofeve (The Instruction to the District Leader M.Neelov about the emigrant I.Prokof'ev). 1623, March, 6. St.Petersburg Brunch of the Institute of Russian History, f. 109, d. 255. Pamyat' 1659 - Pamyat' zastavnomu golove Onezhitskoj zastavy Vasiliju Borkovu o propuske za rubezh rugodivtsa T.Stralbona (The Instruction to the Onezhitsy outpost commander Vasyly Borkov about the omiting throw the frontier T.Stralbone Rugodiv (Narva) tenant) 1659, July. St.Petersburg Brunch of the Institute of Russian History, f. 109, d. 135. Pamyat' 1663 - Pamyat' iz Novgorodskogo Dvortsovogo prikaza sotniku streletskomu L.Aristovu ob otdache na obrok stroitelyu Troitskogo Zverinskogo monastyrya startsu Feodosiyu s brat'ej srokom na 10 let bez perekupki pustoshej Chaschits, Ozereshny, Chasovenki i Olkhovtsa (The Instructiom from Novgorod Dvorets Office to the srteltsy Commander L.Aristov to transfer for 10 years without selling waste grounds Chaschitsy, Ozereshno, Chasovenka and Olkhovets to the head of St.Trinity Zverinsky monastery Theodosy). 1663, November, 18. St.Petersburg Brunch of the Institute of Russian History, kol. 172, perepl. 3, d. 240. Perepisnaya kniga 1709 - Perepisnaya kniga pomeschich'ikh, votchinnykh, monastyrskikh i dvortsovykh krest'yan i tserkovnosluzhiteley Vodskoj pyatiny Novgorodskogo uezda perepisi A.N.Selivanova (The Record Book of the landowners. private, monastery's and the Dvorets' peasants and clergy of Vodskaya pyatina of Novgorod district by A.N.Selivanov). 1709. Rossijsky Gosudarstvenny archiv drevnykh actov, f. 1209, op. 1, d. 8576. Peterenko 1982 � Peterenko V.P. Gorodische na reke Lave (The hillfort on Lava river) Kratkije soobschenija Instituta archeologii. 1982. Nr. 171. P. 71-75. Plan lesonasazhdeniy 1874 - Plan lesonasazhdeniy i statisticheskoye opisanije Orlinskoj lesnoy dachi (The Plan of Afforestation and the statystical description of Orlino Forest lot). 1874 Rossijsky Gosudarstvenny Istorichesky Archiv, f. 515, op. 72, d. 6662. Platonov 1995 � Platonov S.F. Ocherki po istorii Smuty v Moskovskom Gosudarstve 16-17 vekov (The Essays on the History of the Time of Troubles in Moscow State in 16th-17th cc.). M., 1995. 5th edition. Rassprosnye rechi 1629 � Rassprosnye rechi streltsov Klinskom Monastyre ob izbienii streltsa Andryushki Kuzmina (The interrogate protocoles of the streltsy in Klinsky monastery about the massacre of one of them Andryushka Kuzmin). 1629, November, 28. St.Petersburg Brunch of the Institute of Russian History, f. 109, d. 753. RShEO 1960 � Russko-Shvedskije Economicheskie otnosheniya (Russian-Sweden Economic Relations). A Collection of Documents. M.; L., 1960. Selin 1995a � Selin A.A. Dva nabljudenija nad izdanijami pistsovykh knig rubezha 15-16 vekov (Two observations on the publishing of the Pistsovyje Knigi of 15 - 16 th cc.) Proshloje Novgoroda i Novgorodskoj zemli. Novgorod, 1995. Selin 1995b � Selin A.A. K istoricheskoj geografii Novgorodskoj zemli. Grezensky i Orlinsky pogosty 1500 goda i russko-shvedskaya granitsa 1617-1618 godov (Towards the historical Geography of Vodskaya pyatina. Grezensky and Orlinsky pogosts in 1500 and Russian-Sweden frontier of 1617-1618). Ladoga i Severnaya Rus'. SPb., 1995. Selin 1996 � Selin A.A. Ivangorodskaya doroga (The Ivangorod Road). SPb., 1996. Selin 1997a �� Selin A.A. Tesov ? 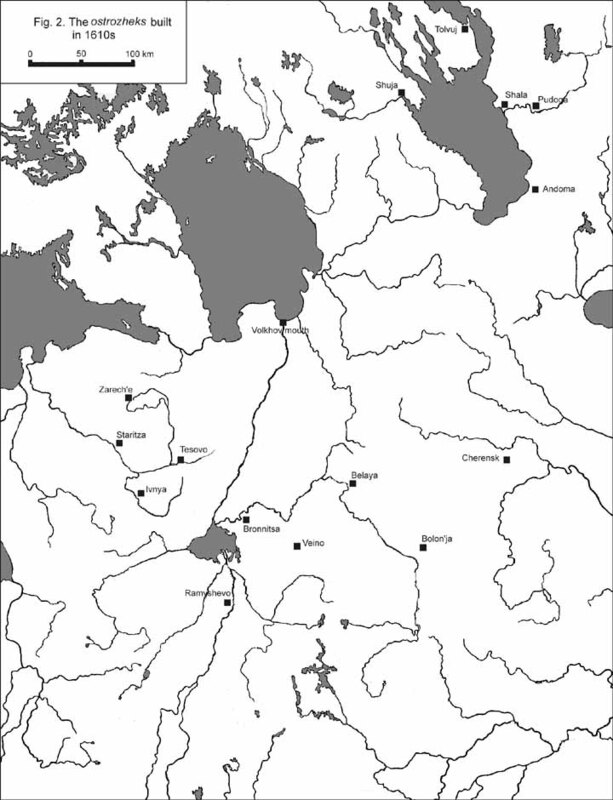 a medieval pre-urban center of the Novgorod land // European Association of Archaeologists. 2nd annual meeting. Riga. 25-29 spt 1996. Program and abstracts. Riga, 1997. P. 85-86. Selin 1997b � Selin A.A. Ivangorodskaya doroga: zaapadny uchastok (The Ivangorod Road: The Western Part) Krepost' Ivangorod. Novyje Otkrytyja. SPb., 1997. P. 215-223. Spornoe delo 1700 � Spornoe delo v vladenii zemlej mezhdu dvortsovymi krestyanami i pomeschikom Pushkinym (The debatable case on the ownership of the land lot between the Dvorets peasants and the landowner Pushkin). 1700, May, 27. Gnevushev A.M. Novgorodsky Dvortsovy Prikaz. M., 1911. Nr. 46. P. 30-34. Sundberg H. The Novgorod Kabala Books of 1614-1616. Text and commentary (Acta Universitatis Stockolmiensis. Stockholm Slavic Studies, vol. 14). Stockholm, 1982. Taavitsainen 1997 � Taavitsainen J.-P. Gorodok - drevnyaya krepostnaya gora v Zaonezh'e (Gorodok - the ancient fortress hill in Zaonezh'e). Archeologiya Severa. Insaltement 1. Petrozavodsk, 1997. Voenno-pochodny zhurnal 1701/05 � Voenno-pochodny zhurnal (s 3 ijunya 1701 goda po 12 sentyabrya 1705 goda) general-feldmarshala B.P.Sheremeteva poslannogo po vysochajshemu poveleniju v Novgorod i Pskov dlya okhraneniya sikh gorodov i inykh tamoshnikh mest ot vojsk shvedskogo korolya (The Military Campaign Daybook (1701, June, 3, - 1705, September, 12) by General-Fieldmarchal B.P.Sheremetev who was ordered to Novgorod and Pskov for the protecting of thses cities and its surroundings from Sweden King's troops). Materialy Voenno-Uchetnogo Archiva Glavnogo Shtaba. Vol. 1. SPb., 1871. P. 59-196. Vorob'ev & Degtyarev 1986 � Vorob'ev V.M., Degtyarev A.Ya. Russkoe feodal'noe zemlevladenieot �Smutnogo vremeni� do kanuna Petrovskikh reform (Russian feudal landownership from �The Time of Troubles� till the eve of Peter the Great's refprming). L., 1986. Widekind 1676 � Widekind J. Istorija Shvedsko-Moskovskoj vojny (The history of Sweden-Noscow War) / Trans. from Latin by S.A.Anninsky St.Petersburg Brunch of the Institute of Russian History, f. 276, op. 1, d. 140, part 2. Zherbin 1956 � Zherbin A.S. Pereselenije Karel v Rossiju v 17 veke (The transferring of Karelians to Russia in the 17th c. Petrozavodsk, 1956. Zhurnal 1770 - Zhurnal ili podennaya zapiska imperatora Petra Velikogo s 1698 goda do zakljuchenija Nishtadtskogo mira (The Joutnal or Daybook of the emperor Peter the Great from 1698 till the Nyschtadt Peace). Part 1. SPb., 1770.